I suppose that if you live long enough and/or do enough inner work, or if the factors-that-be fall into alignment, there comes a time when you no longer can hide from yourself. You lay down your shield of excuses, blame, delusion, etc. because you realize the opponents you thought existed outside of yourself were never the problem to begin with. The problem is inside, and you begin to see that ever so clearly. You recognize your patterns, without fumbling for explanations that justify them. You sit with yourself and admit, “I obviously have a problem with this.” And as you take a few deep breaths, and the fierce sting of shame subsides to some degree, a deeper knowing arises: That you now have an opportunity to stop repeating what has been holding you back for so long. You have a golden opportunity to get off the carousel and transform your life into something greater. It is not too late. You realize there is no job, relationship, or other external condition that will provide abiding fulfillment. For a long time, perhaps, it has been easy to find fault and blame others for letting you down. People and situations disappoint you, again and again. Why? Because you were reaching into outer space for a star to fill you with light instead of opening to the magnificent light shining at your very core! There is no need to look outside of yourself – for you need to make peace with yourself. You need to muster up the courage to open the closet door, turn on the light, and see what’s been hiding in there. And ultimately, you realize you are so much bigger and more powerful than those gremlins you’ve been afraid to face all your life. Those creatures you’ve shoved into the closet in an attempt to convince yourself and others that they aren’t there. Guess what? Everyone has (or has had) a closet like that. Shame has never served you. You realize you cannot look anywhere outside of yourself for happiness, satisfaction, contentment, fulfillment, etc. It was your own responsibility all along, and any time you handed it over to another person, situation, or quick fix, you were only disempowering yourself. You were fooling yourself all along and putting far too much responsibility on other people and conditions. And that’s not fair to anyone, including yourself. You realize the problem is not that you were overlooked, misunderstood, mistreated, or rejected by others. It was that your own sense of unworthiness was running the show and grabbing whatever disguises it could in order not to be noticed for what it really was. It pointed fingers outside so as to avoid attention and certain death (which it faces now that it has been exposed). You realize your habit of competing against and/or comparing yourself to others has been counterproductive all along, and instead of helping you to improve yourself, it has been feeding your Inner Critic that has become the biggest, most ruthless bully you’ll ever face. A bully who employs allies to reinforce its belittling agenda and succeed in brainwashing you. And then it becomes clear why you have agreed to so many compromises through the years: Because you don’t believe (or haven’t believed until now) that you are worthy of more. Where did that message come from in the first place? Again, you’re tempted to look outside of yourself and make up stories. You become one helluva storyteller and believe in the reality of the fiction that you, yourself authored. You can get stuck in blame if you are not mindful. You feel completely naked and vulnerable, like a hermit crab that has outgrown his old shell and slips out of it but has yet to find a larger, more suitable shell to inhabit. From the outside, it might look like you have lost your way, even lost your mind. But releasing yourself from a truth or a lifestyle that has become too small and confining is a step in the right direction, especially if you leave it lovingly and with plenty of compassion for all involved, including yourself. You simply cannot find in “outer space” what you need to awaken to and cultivate inside your own skin. And you know what? Even though the shame of it all might sting and burn and make you question why you are even alive in the first place, beneath all that melodrama (in which the ego is fighting for its life) you realize you have arrived at the place where true freedom and empowerment begins. You are only feeling so much pain because you have gained awareness. You are experiencing growth pains! You realize your tendency to compete with or compare yourself to others is unhealthy, and your neuroses and/or addictions (and yes, you do have some) are not your friends. They are the starving little gremlins in that dark closet that compel you to feed them or else. Or else what? Or else they will convince you that you are not enough and therefore are unworthy of true happiness and success. They have been brainwashing you into believing that what you want or need is outside, so run off and get it! (The starving gremlins need to be fed!) Go out and buy whatever costume you can find to impress others and focus their attention on the outer appearance that covers your inherent sense of unworthiness. No, thank you. This delusion will no longer suffice. It is absurd. So what does this all mean? Quite simply, in this moment, you have a choice: To continue beating yourself up or to inhale deeply a fresh, new, higher truth. When you finally realize what you are doing – the harm you are causing to yourself and others that you used to blame on factors outside of yourself – it becomes less possible to continue allowing it. Rather than wish for a savior, you resolve to take matters into your own hands and stop repeating self-destructive patterns. You resolve to adopt healthier habits, beginning with your own thoughts and self-talk, and when you notice yourself applying an emotional charge to a thought that arises, you look it square in the eyes and nip it in the bud – pull it up, roots and all. From here forward, the only viable option is to tell yourself a new, more hopeful and less dramatic story and to seize the courage to live in alignment with your Higher Self – for that voice becomes stronger every day and finally overpowers the discordant howl of your lower nature. You begin to trust that kinder, gentler voice and to have faith in the process. To unclench your life and be patient. To be your own knight in shining armor. Sometimes the Universe seems to conspire to ensure that certain works are accomplished or (in my case) images are captured. You can call it intuition, inspiration, or various other names. It’s the voice that might literally wake you up so you can be in the right place at the right time and sometimes employs unwitting accomplices. That happened to me yesterday morning, after staying up late doing research. At 6:00 a.m., my phone rang. It was the director of a private school calling to ask if I could fill in for the day. I had to decline because I had promised to care for my granddaughter for a few hours. After taking the call, I realized I wouldn’t be able to get back to sleep, although I closed my eyes to try. But something about the misty morning light compelled me to get out of bed, despite not feeling as rested as I wanted to be. It had been a while since I’d photographed a river sunrise, mainly because of my late night work habits. It was a shocking 7° (F) outside and a morning when I’d prefer to stay indoors. But something wonderful was about to happen. I could feel it and (as I’ve said before) have learned to trust that feeling. So I put on my warm clothes, coat, and shoes and went to the chilly river’s edge to photograph the sunrise, which looked rather like a painting. If there is a way to predict the “wow” value of sunrises and sunsets, I have yet to discover it. But the pink-orange mist was intriguing, so I stayed outside to see how it would develop. As the sun began to climb the trees, the way it played with the trees and appeared to stretch their branches with golden light was phenomenal. In my four years of photographing sunrises on the river, I’d never witnessed that particular effect so intensely. It made me think of Moses and the burning bush – for the trees were “on fire” with brilliant light but not consumed. I hoped I could capture it exactly as it appeared so as to express what drew me to it and stopped me in my tracks – because when a sight grabs you like that, there must be some kind of spiritual nugget in it. I selected the image below to share online because the way the various elements came together was most pleasing to me. The deciding factor was the relationship between the branches stretched by sunlight in the center of the image and the branches across the river in the lower right corner that seemed to reach out to them. That spoke to me. After I shared the image, people reported being drawn to different elements of it and seeing certain shapes and symbols in the sunlit trees. I’m fascinated by how we gravitate to certain images or elements and discover meaning or satisfaction in them. When we gravitate toward an image, it’s an invitation to go deeper. We can consider what calls us to it. What is our connection to it? What does it stir in us? What longing does it satisfy? What does it reflect that is alive in us? As I contemplated the above image, the words that arose from it were: Source it higher. Fuel your life from a higher source. Gas station and food metaphors came to mind. Tapping into ordinary consciousness is like filling up with regular gas or fast food that makes you feel jittery. But there are higher quality options, like premium gas or farm-to-table, organic meals containing a rainbow of nutrients that leave you feeling truly nourished and energized. A beautiful soul who adopted the name Peace Pilgrim said, “Junk thoughts can destroy you even more quickly than junk food.” That is the idea I’m trying to convey. My infant granddaughter, Ava, arrived soon after I photographed the sunrise. She napped a few times during the course of our time together. She fell asleep in my arms, when I swayed gently with her, and when I lay her on my bent legs so we could face each other. As she rested in her human cradle, I found myself feeling bad about conditions in her life. But then I heard, “Source it higher” and recalled the luminous image of the sunrise trees – and lifted into a state of trust. I thought of how many challenging circumstances I’ve lived through and realized that my own life experience will help me to trust in her strength and guide her to discover her own strength and resilience. It seemed the spectacular sunrise was the source of the energy I was giving Ava – the energy she was feeding on, even as she slept. “Source it higher,” backed by the sunrise image, has quickly become my new mantra that helps to dispel worry and fear. It reminds me to unplug myself from a lower source of energy and tap into a higher, more luminous source. Without a mother or grandmother in my life anymore, it seems to be up to me to hold the faith and nurture subsequent generations. Connecting with that light eases my worries and allows me to trust what is and what is in the process of becoming. When I opened my eyes this morning, I was surprised to find the landscape covered with snow. I’d heard talk of snow in the forecast for this weekend but never checked the forecast for myself – and after yesterday’s warmth, chalked it up to an April Fool’s joke. But sure enough, the ground and the trees were white. I sprung out of bed with my sights set on the daffodils I’d photographed yesterday in the park. 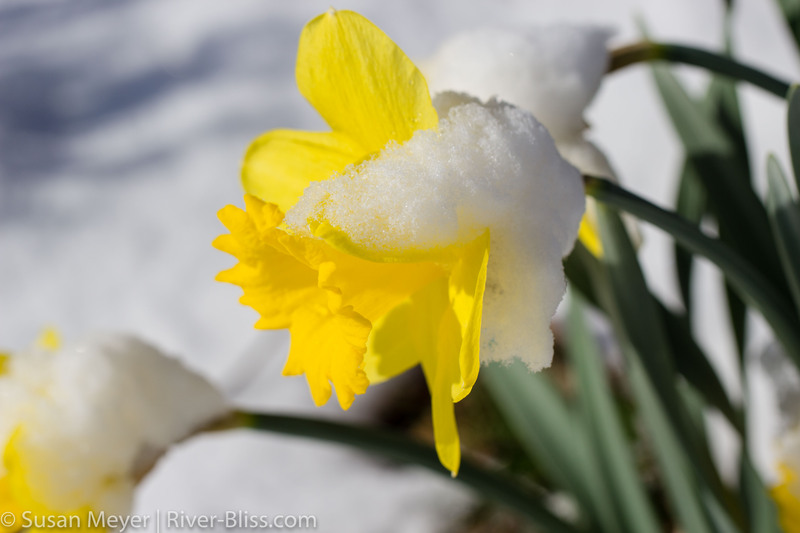 It felt Really Important to photograph daffodils blooming in the snow, although I didn’t know why. I have learned to trust that feeling and didn’t waste a moment getting to the park. As I spent time connecting with the snow-covered daffodils, it dawned on me why it was so important to photograph them. They carried a message of hope that seemed relevant to challenging times in general, and to my daughter’s current situation, in particular. Some daffodils were fully bloomed. Others were working on opening up more. Some were still closed, with tips swollen and yellow. Most had some snow on them, and some were more weighed down than others by snow. The message that came through is: Don’t give up because you wake up one morning and find yourself weighed down by a clump of snow on your back. It’s not going to last. The snow that is weighing you down at this moment is temporary. It will melt. In the meantime, keep your face to the sun. I photographed one daffodil that had what looked like a petal of snow hanging from it. The instant after I snapped the picture, a small twig broke free from being tangled up with other twigs and smacked the snow petal off of the daffodil. Just like that, the snow was gone. Several minutes later, a gust of wind came along and blew the snow off some of the other daffodils. Meanwhile, the sun was rising in the sky and becoming warmer and would melt the rest of the snow in time. But you might not even have to wait for the warmth of the sun to melt the snow from your petals because the wind or a twig – or even a person or animal passing by – might come along and remove your burden in an instant. Your situation can change in a heartbeat. New information, possibilities, and answers have been known to fall from the sky. Be aware and receptive. As these associations came through the snow-covered daffodils, I spoke them into my voice recorder. I thought of my daughter and felt eager to share my daffodil insights with her, even though I realized it might be one of those “you had to be there” instances that wouldn’t transmit as powerfully as it was experienced. As I was recording, I looked up, and a woman appeared walking on the path hand-in-hand with a very young girl. They were heading in my direction, and I guessed the little girl was younger than two years old. The pair instantly brought to mind my daughter and infant granddaughter. They also brought tears to my eyes because it felt like a serendipitous occurrence. I sensed the Universe was both reinforcing my insights and assuring me that my daughter and granddaughter would be okay by showing me this woman and very young girl walking peacefully along the path. It turned out they were the only people I saw the whole time I was at the park. Keep blooming. Don’t become discouraged. We have no idea how quickly circumstances – like the weather – can change. Yesterday, it was sunny and warm. This morning, the ground is covered with snow. But it will be gone soon. Don’t give up, even when the cold stings your back, and the weight of it all pushes you down. You have the warm sun – whatever source of light you have in your life. (There is a source of light in everyone’s life.) Trust it. In time, it will melt the snow. Don’t become disheartened. You never know who will cross your path and what conversation might change your course. Be receptive to all the assistance that is available to you and discerning about what kind you are willing to accept. Be wise. But don’t wait for someone to come along and rescue you. Show up. Do what you can, without overdoing. Put all your energy into blooming. Have faith that the Universe will help you do it. Even when there’s more snow in the forecast, realize it won’t last. The sun grows stronger every day. One sunny afternoon last week, while walking the labyrinth in a nearby park, my walking meditation was interrupted by two boys on bicycles at the top of an adjacent hill, between two slides. My guess is that they were about nine years old. After some consideration of the bumps they might encounter on the way down, they decided it was a good idea to ride their bikes down the grassy hill (with a large bump midway down) and through the labyrinth. Although I prefer uninterrupted solitude when I’m walking the labyrinth, I enjoyed overhearing their conversation. Clearly, the first (presumably older) boy was thrilled during and after the daredevil mission. The second, more cautious boy seemed to enjoy it, too, and after he came to a stop on the other side of the labyrinth, exclaimed, “Boy, that activated my nerve!” – which I found amusing. His words were so honest and sweet. But they went ahead with it, and they did fine. They looked jubilant, presumably because they took the risk and conquered their fears. It was inspiring to witness. And I wondered: When do we stop taking risks, give in to fear, and refuse to step off the well established path to follow our curiosity into unpaved territory – and miss out on the wild and empowering ride? The thrill of it. After their third time down the hill (and through my labyrinth walking meditation), their parents returned. I realized I had passed this small group of parents on the trail about 20 minutes earlier and was drawn to their vibe. They allowed the boys the freedom to be out of their sight and to explore on their own. To bring their experience and knowledge to a new situation, weigh the benefits and risks, make a decision (intelligently, not impulsively), and gain confidence and/or wisdom. Obviously, the parents had enough faith to allow the boys to explore rather than remain at their side, afraid of them making mistakes and getting hurt. It wasn’t until several hours after watching the boys ride bicycles down the hill with exhilarated expressions on their faces that it occurred to me how perfect it was to witness that on the same day my son got his driver’s license. It was also the day when I had a major breakthrough during seated meditation. The breakthrough was something I had been hoping for for a long time, and it left me feeling that I would now be able to push through a barrier that had been blocking me for as long as I could remember. That feeling filled me with an expansive sense of freedom. Only moments after I finished meditating, my son called me to announce he had passed his road test. It felt like we both graduated to levels of greater freedom simultaneously, along with the brand new grass that covered the trail with a noticeable carpet of green and the tiny, emerald tree buds that decided it’s time to burst forth. And the boys on bikes. Before the boys came along on their bikes, I had been walking the labyrinth thinking about how there are times to focus on a certain thing, times to expand your vision and notice what else is around you, and times to focus inward and pay attention to your footsteps touching the earth without getting distracted by outer influences. I would add that there are times to allow whatever arises during meditation without resisting it and to learn what you can from it – in this case, boys on bikes with exhilarated smiles shooting straight through the labyrinth, modeling a sense of excitement and adventure that is downright inspiring. Note: The featured image for this post was captured nearly three years ago, in early June. Our grass is not that tall at the end of March! What a difference one week makes! After the balance of sunlight tipped in favor of the Northern Hemisphere last week, I wasn’t ready for winter to end – which might be a first. Winter is the season of going inward, reflecting, and preparing for a new season of growth, and I wasn’t ready for the daffodils to shoot up so soon because my winter work wasn’t done. Although I was as thrilled as ever to hear a chorus of spring peepers for the first time when I drove by the creek one evening, at the same time, it felt premature. I needed more time! I was not ready to emerge from underground and shoot up with the daffodils and grass because I remained unclear about where I wanted to focus my energy and how I wanted to grow! Mercifully, a week later, the energy has shifted. Now my energy is concentrated on a single purpose, and the seeds sown within me are ready to grow in the world. Apparently, I was right to trust the process and to believe clarity would arise in time – just as the plant world awakens every spring following a season of necessary dormancy. It was bound to happen. As plants began invisibly sending out their roots, I found myself returning to both my spiritual and my photography roots. The waterfalls of Ithaca, NY provided my original inspiration for picking up a camera (an old Canon point-and-shoot) nearly 30 years ago, and in recent weeks, my passion for waterfall photography was reignited in full force. This month, I visited two waterfalls I’d never been to before. One was on a road I lived on when my children were young. I must have driven by it on nearly a daily basis but never noticed it! It’s an example of the countless opportunities and blessings that are overlooked when we’re caught up in our daily routines and don’t think to turn our heads a little more to either side and notice what exists in the periphery. As I processed my photos of that waterfall, I was drawn to the large rock in the middle of it (that resembles a turtle). It’s not the sea, but it speaks to me of believing in yourself, standing your ground, and being centered, even when there are many different streams of activity flowing around you and so much stuff going on that it can become distracting and feel overwhelming. On Easter, I visited another waterfall and spent more than two hours in complete solitude working and worshipping in what felt like a private sanctuary. I sang, cried, prayed, gave thanks, and took plenty of photographs as the negative ions worked their waterfall magic on me. In addition to returning to my photography roots, I recently had the great pleasure of returning to my spiritual roots and photographing the interior of the church I attended as a child. I hadn’t been inside the church (which has been converted into a performance and event venue) since I was nine years old but had vivid memories and dreams of the entire interior. I’ve been wanting to photograph it for years. Once, a few summers ago, I tried to enter, but the doors were locked, nobody answered the doorbell, and I never tried again. My son recently organized a film festival for young, local filmmakers that serendipitously took place inside my old church, so I seized the opportunity to explore and photograph it while he was in a meeting. I was so excited to finally go inside after 40 years and was in my glory photographing my memories, including the brass banister on the stairs when you walk through the interior set of doors, the old choir room, the stained glass windows – all as I remembered them – and locating the various rooms, including the unassuming door in a corner that led to the Sunday School rooms down in the basement. The space that was most radically different was the nave and sanctuary upstairs because all the pews had been removed, along with the entire chancel, including the resplendent pipes of the pipe organ. But it still smelled exactly the same. It was blissful to be alone in the former worship space as the late afternoon sun streamed in through the stained glass windows. I’d never attended an event at the church after it was converted to a performance venue, but I tried to go inside once, and because the door was locked, I assumed it was generally inaccessible. However, when I left the church at the end of my son’s meeting and the following day at the conclusion of the film festival, the door remained unlocked. People were coming in for dance classes and other events. It was an active venue with doors that were not always locked. The reality is that I tried to open the door once, and it was locked. And then I didn’t try again. Is that a great metaphor or what? In recent months, I’ve been unearthing and releasing some deeply held beliefs and conditioning regarding money and entrepreneurship because it is time to make some changes rather than continue to repeat the same patterns that have not served me in the past. In the grand scheme of things, money is just another form of energy that shouldn’t be so weighty and intimidating. However, financial prosperity is something I have been passive about until now. It was a door I knocked on, but when nobody answered, I just moved on, believing it was locked and inaccessible, and I did not have permission to enter. But now I have become curious. What if I were to find out at the end of my life that the door was unlocked the whole time, and I only assumed it was locked and lived my entire life as if that were the case – and never turned the doorknob? Or perhaps I tried just once and found it locked and assumed that was always the case, so why bother trying again? Well, there is a voice inside me now urging me to turn the doorknob and find out what’s inside the rooms I had considered off-limits. In other words, what is on the other side of fear? That is the metaphor I take away from the church experience. Our circumstances aren’t what block us. Our assumptions about our circumstances and ourselves in relationship to them are what block us. What might we accomplish if we adjust our mindset and beliefs, become more adventurous, and empower ourselves to do something different this time – and actually turn the doorknob of the room we hadn’t felt worthy of entering in the past, instead of retreating to the familiar spaces? It’s like failing to notice the waterfall on the street I once lived on because I never turned my head just a little more to one side. I can’t help but wonder: What are we missing out on by not doing something different? What kind of new shoots can we push up this year by challenging our assumptions and being a little more curious and adventurous? With nature as my mirror and guide, I believe it’s time to find out! We just went through a really cold spell with temperatures I don’t recall ever seeing before! When I woke up Sunday morning, it was -20°F without wind chill! Over the weekend, the temperature recorded at Whiteface Mountain (a two-hour drive away) with wind chill was -110 degrees! When it gets that cold, your attention turns to maximizing your home heating efficiency. You notice where the heat is going and determine the vulnerable spots where the heated air leaks out and the frigid air slips in. You figure out which areas are most important and close off non-essential spaces so you can direct the heat to where it’s most needed. You might find yourself placing a fan strategically at the top of the stairs and putting duct take over electrical outlets that allow cold drafts in. When it’s really, really cold, you take a good, hard look at where your heat goes passively out the window and do whatever you can to concentrate it where it matters most. You become more mindful. This morning, I woke up around 4:00 thinking about my work. I couldn’t get back to sleep for about an hour and a half because my mind was busy wondering: How do I make all this work? In the process of thinking, the metaphor of heating a home during winter came to mind. When we first moved into our current house, the main door was very old and made of wood. In the winter, it let in so much cold air that it wouldn’t have made much of a difference if we left it cracked open. When the cold, winter air set in, it was the first improvement we insisted on, and it was replaced with a new, much more energy efficient door that reduced draft greatly. Heating our home is a metaphor that can apply to how we use and focus our energy in many areas of life. For example, when money is tight or you’re sleep-deprived, you need to take a hard, honest look and consider how to use your energy most efficiently and effectively. So I consider what activities and influences in my life are like the old door and how I can replace them with better alternatives. Am I investing my energy and attention in reaching people who don’t value my work? If so, then I need to reclaim that energy and put it into a more fruitful channel(s). Ultimately, I don’t think it’s a good use of my time and energy to wake up at 4:00 in the morning consumed with how I’m going to make it all work. It would be more beneficial to get rest so I can wake up with the energy to keep doing the creative work I love to do while also learning about the “other” piece. Staying awake at night thinking seems like spending frigid days in an uninsulated room and attempting to heat it with a space heater, whereas sleeping is like installing insulation or moving to a room that holds the heat more efficiently. Realizing this, I called on the angels to guide me – turned it over to them. Then I fell asleep for a couple hours and woke up feeling rested. As I slept, I had a dream in which a little song came to me. The words were: Do what you love without worrying or wondering. It all will be alright. In the dream, I was tapping it out musically, over and over, and then a friend joined in on a hand drum. I was awakened from the dream by the sound of a text from my sister. It seemed that kind of repetition and turning the words into a rhythmic song was necessary for me to remember them upon waking. And the text alert was perfectly timed because I woke up in the middle of the musical repetition. It seems the angels always deliver when I call on them for help. Today the temperature is expected to reach 50°F. Above zero. Go figure. But the brief snap of frigid weather provided a new metaphor. And when I find myself becoming impatient with the pace at which things are moving, I look out the window at the river that appears frozen solid and am reminded that, down below the surface, things are moving along just fine.